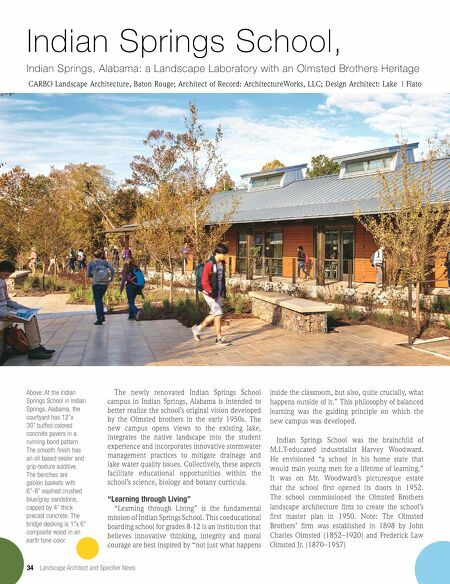 Top, Right: Runnels lined with locally sourced aggregate collect roof water at all building drip lines and convey it to the rain gardens nestled between the classrooms. These rain gardens detain and biologically filter the stormwater before slowly releasing it downstream to the lake. Bottom, Right: The bridge over the rain gardens is steel framed and has custom concrete piers. The new school buildings are constructed of cast-in-place board-formed concrete, stained shiplap cypress siding and standing seam metal roofs. June 2018 35 The Olmsted Brothers' original concept reinforced the school's ideologies by emphasizing a community of smaller buildings with strong physical and visual connections to the site's 30-acre lake. Unfortunately, their master plan was never fully realized, and their vision was abandoned during campus expansions in the 1970s and 80s. New buildings were clustered tightly together and connections to the lake were disregarded. 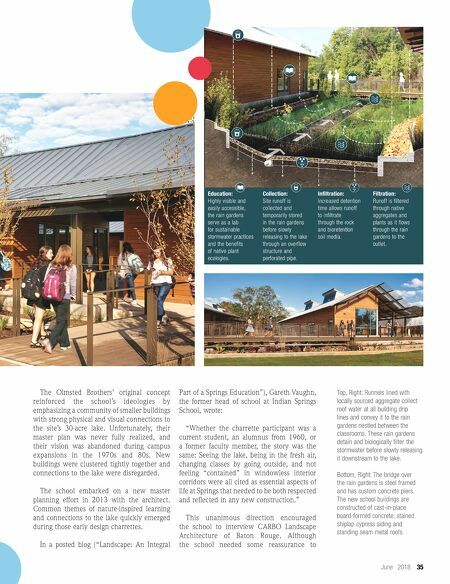 The school embarked on a new master planning effort in 2013 with the architect. Common themes of nature-inspired learning and connections to the lake quickly emerged during those early design charrettes. In a posted blog ("Landscape: An Integral Part of a Springs Education"), Gareth Vaughn, the former head of school at Indian Springs School, wrote: "Whether the charrette participant was a current student, an alumnus from 1960, or a former faculty member, the story was the same: Seeing the lake, being in the fresh air, changing classes by going outside, and not feeling "contained" in windowless interior corridors were all cited as essential aspects of life at Springs that needed to be both respected and reflected in any new construction." This unanimous direction encouraged the school to interview CARBO Landscape Architecture of Baton Rouge. Although the school needed some reassurance to Education: Highly visible and easily accessible, the rain gardens serve as a lab for sustainable stormwater practices and the benefits of native plant ecologies. Collection: Site runoff is collected and temporarily stored in the rain gardens before slowly releasing to the lake through an overflow structure and perforated pipe. Infiltration: Increased detention time allows runoff to infiltrate through the rock and bioretention soil media. Filtration: Runoff is filtered through native aggregates and plants as it flows through the rain gardens to the outlet.